Hey! I’m waiting for you under this mandarin orange tree, when are you coming ya? Seriously… Chinese New Year vibes going strong here! Few days ago, I had A Blossoming Day at Suria KLCC Mall’s Mandarin Orange Garden. Can you imagine, the mall has been transformed into a magnificent Mandarin orange garden with the theme “Abundance of Prosperity”. There are lots of fun activities to explore and I have spotted many instagramable corner that we could take pictures. Let’s check out yo! Suria KLCC’s Centre Court has been transformed into a stunning garden decorated with Mandarin oranges, red lanterns, bamboo, peonies, other flowers too. Well these decorations signify fortune, wealth and abundance, plus it depicts a garden in a traditional Chinese courtyard house. Personally, I find it very anciently romantic to meet up with my loved ones in this mandarin orange garden, especially under the tree with such red lanterns. It reminds me of some old Chinese movies, don’t you think so? If you want to date me, please wait under this mandarin orange tree... hahaha. Beside, Suria KLCC Mandarin Orange Garden at centre court, the 40-feet ‘Basket of Good Fortune’ at KLCC Esplanade. I also spotted another instagramable place at the KLCC Esplanade entrance. By the way, there are many more instagramable spots to take photos when you are at Suria KLCC. Remember to take as many shots as you like for memories because these decorations will be displayed until 22nd February, 2019 only. 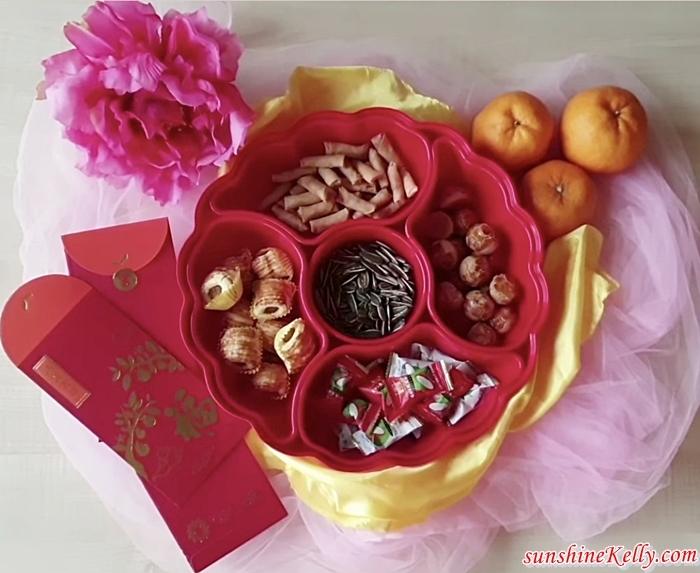 You know, we always have mandarin oranges at home, offices, shops or as gifts during Chinese New Year is said to bring good fortune and abundance. Because Mandarin oranges is pronounced as ‘kam’ in Cantonese and it sounds similar to the word ‘gold’ therefore it represent good luck. So this Chinese New Year, we are surrounded by good fortune, luck and prosperity at Suria KLCC Mandarin Orange Garden hahaha. And… look here the giant 40-feet height Basket of Mandarin oranges replica known as ‘Basket of Good Fortune’ at the KLCC Esplanade. Remember to take a snapshot or many shots until you get what you want because the replica will be displayed until 22nd February, 2019. Oh ya! Don’t miss out the exciting performances at the Centre Court such as the traditional Chinese five pieces musical ensembles, 10 festive drums, traditional dance, dragon dance, lion dance, high pole lion dance and also meet the God of Prosperity from 23rd January to 19th February, 2019. 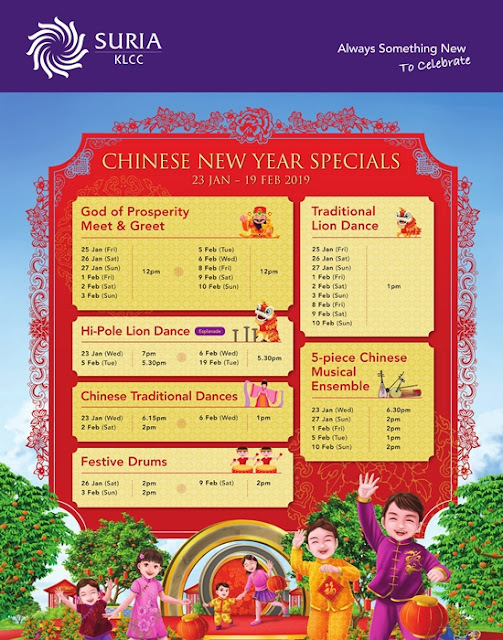 During the launch of Suria KLCC’s Chinese New Year campaign, I also had the chance to watch the thrilling lion dance by the award winning Kwong Ngai Acrobatic Lion Dance Group at the Esplanade. It’s shopping time! Celebrate Good Fortune and Prosperity at Suria KLCC from 19th Jan till 10th Feb, 2019. Citibank Visa card holder who spend a minimum of RM1,000 in a single receipt will receive an exclusive candy tray, a pack of ‘Ang Pow’ packet and Suria KLCC parking ticket worth RM10. The parking ticket is limited to first 30 Citibank customers per day. Let’s not forget about the less fortunate during festive season too. Suria KLCC continues to collaborate with Hospis Malaysia in a ‘Speak Up – There’s an Elephant in the Room’ campaign, creating awareness and seeking public support towards ‘palliative care’ programme championed by Hospis Malaysia. 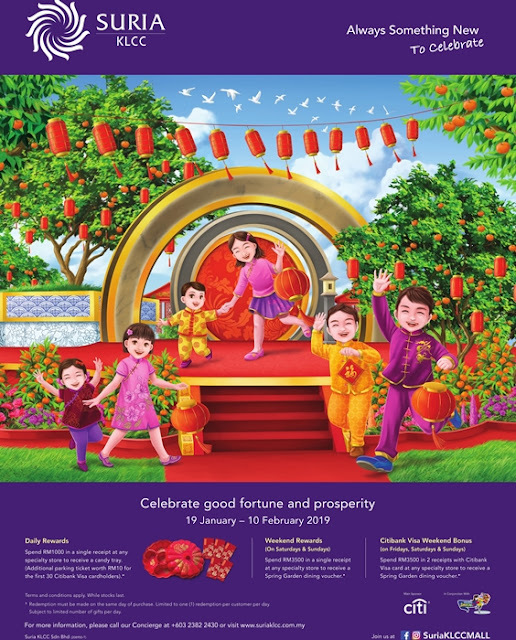 Suria KLCC work with Hospis Malaysia aim to raise RM10,000 donation collectively from 19th January till 22nd February 2019 through merchandize selling & direct donation from shoppers. Shoppers that donate RM15 will entitle to redeem a token of appreciation. Shoppers who are interested to donate can proceed to the Concierge at Level Concourse or call 03-2383 2828. Overall I had A Blossoming Day at Suria KLCC Mandarin Orange Garden. I love the auspicious garden with mandarin oranges, lanterns and flowers at the Centre Court, 40-feet Basket of Good Fortune at the Esplanade plus the surrounding vibes and performances here. This is one of the best mandarin orange garden. Your pictures in the gadgen is very lovely. Yes indeed, always look forward to their festive decors. BTW Happy CNY Kelly ! Thanks Amni, me too. I pun suka makan limau mandarin during CNY. Hi Amanda, betul memang banyak aktiviti and also banyak spots untuk ambil gambar. Semua nya best best. Suria KLCC has never disappoint with its extravagant, large and beautiful decoration - for whatever occasion. Love the traditional take of the garden. I will see you under the orange tree ok.
Hi Rawlins, so so true. Every festive season mesti ada sesuatu yang surprise for me. Hi Syuhadah, meriah memang meriah kat sini. Tambah tambah lagi lagi Cina yang rancak lagi ong. Wah..suka tgk decoration dia canton, happy CNY to you Kelly. Thanks Kak Halimah. Happy Holidays to you too. I love KLCC went they doing the decorations for any celebration. It look verry beautiful. Now they do the decorations for CNY, im very excited to go there for CNY. Yes go and take many many photos for rememberance. Have fun with your family there. We went to KLCC today and Daughter said Wahhhh Besar nya orange! Hahaha. Happy Chinese New Year to you! May the new year brings u happiness & prosperity! Betul betul, my first time nampak the huge orange basket kat KLCC Esplanade i pun Wah Wah Wah! juga. Happy Chinese New Year Kelly !! May the year fill with joys n properous. I have seen the giant mandarin in KLCC. It is magnificient ! Very instragrammble place. Thanks Zharif, yes indeed there are many instagramable spots there. Hi Bonda, i pun suka tarian singa and naga sangat meriah and happy mood. Wah KLCC nampak cantik dan meriah dnegan hiasan pokok limau mandarin. Nampak cantik semua gambar you .I kagum tengok replika Basket of Mandarin tuh .Kalau sambutan CNY tak sah kalau tak ada tarian naga singa tu . Hi Mimi, ya setiap perayaan decorations kat KLCC memang outstanding la. Best kan tak sia sia pergi. Wow! Beautiful with the decoration ideas and design. Aeon Malacca also have their own ideas and I really love it . It looks so nice and wonderful. Yes i love their decorations, shopping and makan pun banyak pilihan. This looks great. Happy chinese new year to you and your family. Thanks and Happy Holidays to you Kay. Hi JMR, thanks and Happy Chinese New Year to you and your family.